Additional chain is sold for $50 per 6 feet. Please email us at cs@kathykuohome.com to place your order. 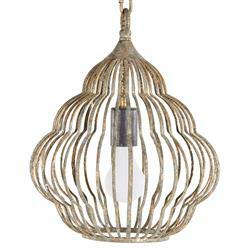 Pairing antique inspired design with modern influences, the Nathaniel pendants are available in large and small sizes. These wonderful chipped antique gold finished pendants bring their sophistication to any space through their organic beehive shape. The pendants feature two candle like lights on the interior of the fixture’s beautiful slatted iron frame.